Pop-Up Puppets = Hands-On Learning! 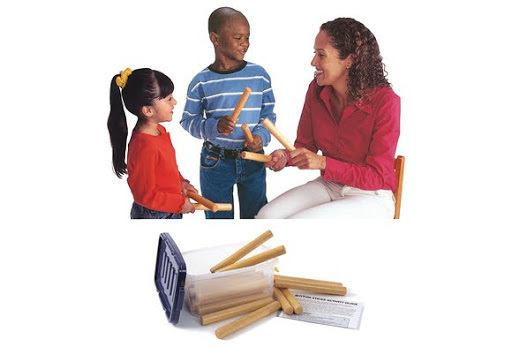 I have been using Discount School Supply’s Counting Pop-Up Puppets with great success in introducing math and science concepts, supporting literacy skills and dramatic play, as well as promoting movement and physical activity. This set of 5 hand puppets include: 1 flower in a flowerpot, 2 penguins on an iceberg, 3 birds in a nest, 4 ladybugs on a leaf, and 5 green and speckled frogs on an old brown log. Each puppet has a flap with the numeral under it matching the number of items on the glove, i.e. the numeral 3 is under the flap of the 3 birds in the nest. 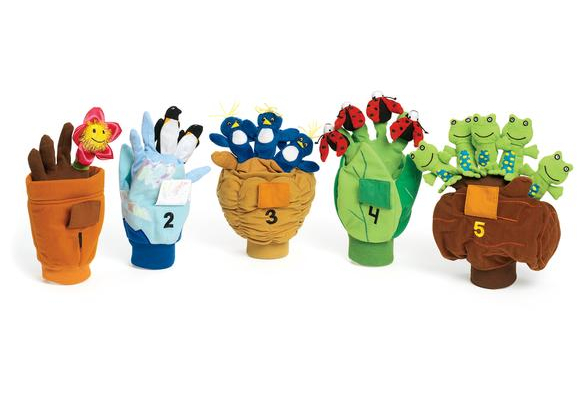 Using the 5 puppets helps you teach numbers 1-5, one-to-one correspondence, numeral recognition, ordering and matching, addition and subtraction. Reinforce ordinal numbers by asking the children which puppet is first, last; first, second, third. Cardinality is addressed when the last number named is the quantity of object counted–tells “how many.” Life science includes the study of plants and animals and the puppets show their habitats. I’ve listed below an activity–song, dramatic play, dance, movement–to use with each puppet. Let the children put the puppets on their hands and stage a play! Puppets are a great tool to use in engaging children in the learning process. Act out this poem by having the children crouch down low to the floor and pretend they are seeds sleeping. Then encourage them to stand up slowly until they are fully extended as the seeds sprouted (with the help of the sun and the rain) to become beautiful flowers. Four red ladybugs sitting on a leaf. They sit on a leaf on a tree. There are so many friends to see! When the child hears their name they wave their hand in greeting. Eating some most delicious bugs — YUM! YUM! Then there are four green and speckled frogs. RIBBITT! RIBBITT! RIBBITT! RIBBITT! Now there are no green and speckled frogs. According to the National Association for the Education of Young Children, good toys for young children are ones that “match their stages of development and emerging abilities.” Toddler Movement Scarves (MOOVIT) are sized for the very young child (birth-36 months old). Each Toddler Movement Scarf consists of 3 colorful 10” square sheer scarves securely attached to a velcro wrist band. 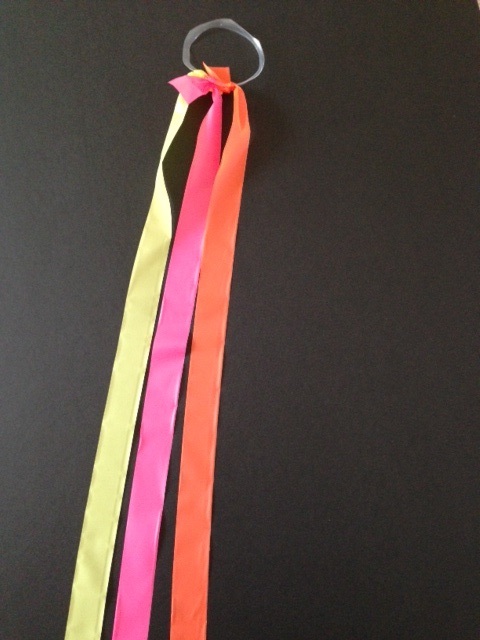 It’s an appropriate version of the “streamer ribbon” for the toddler set. Here are several fun activities that develop gross and fine motor skills, promote moderate to vigorous physical activity, and boost brain development. Get moovin’ and groovin’ with your little ones! Lie the infant on its back and move the scarves above their face. Slowly move your hand up and down, in circles, and to the right and left. This activity provides practice with visual tracking. Sit on the floor with the baby, and cover your face with the scarves. Take off the scarves and say, “Peek-a-boo.” Do this a few times before trying it on the baby. Then cover the baby’s head with the scarves. Stop immediately if the baby shows any sign of disliking this. Pull the scarves off and say “Peek-a-boo.” Along with being fun, peek-a-boo teaches babies the concept of object permanence, which occurs somewhere between the ages of 4 and 12 months. A baby learns that even if something is out of sight, it still exists. Sit on the floor with the baby. Cover a toy with the scarves and say, “Where’s the toy?” Let the baby find the toy by pulling off the scarves. 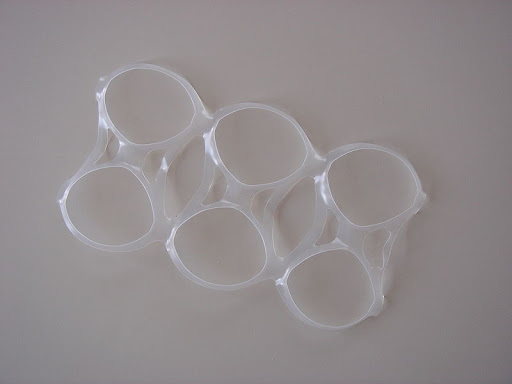 This activity promotes eye-hand coordination and fine motor skills. Encourage gross motor development by attaching the scarves to a pole or chairs to create a tunnel or “car wash” for the baby to crawl through. 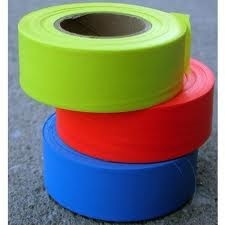 Encourage children to use their imagination and be creative with the scarf. It can be a tail on a horse, a butterfly, a falling leaf, etc. Run with it and pretend it’s a kite. Look at the world through the tint of the fine mesh fabric. What do you see? What else can you do with your scarf? 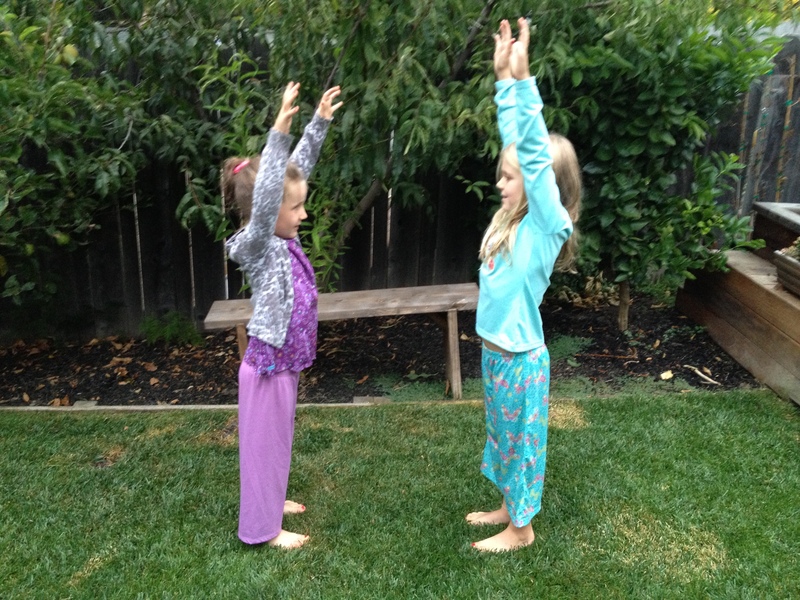 Movement exploration allows children to problem solve, explore spatial relationship skills, and use their large muscles. Start the music and bodies start moving. With a scarf in their hand or around their wrist, encourage the children to dance and move about freely in the open space. 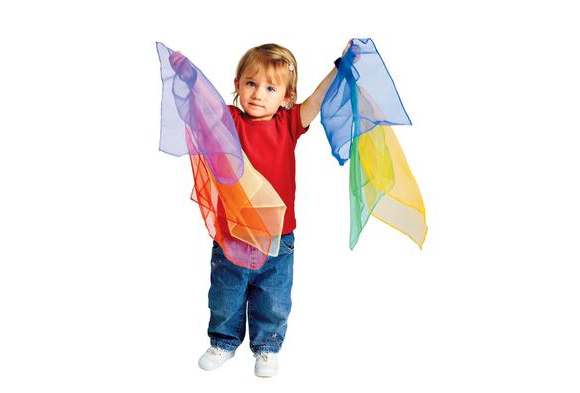 Suggest to the children that they move the scarf fast, slow, high, low, side to side, and all around. Tell them that when the music stops, they are to stop and freeze (stand motionless like a statue). When the music starts again, children resume dancing. Ask children to follow along as you swish the scarf across the front of your body, make figure eights in the air, circle the scarf in front of your body like a Ferris wheel or circle it over your head like a helicopter blade.Try to trick the dancers by starting and stopping the music quickly. They love the element of surprise! Use all different types of music: fast, slow, classical, rock, salsa. When playing a slow song, suggest the children twirl, leap and float to the music. Scarf dancing promotes cross-lateral movements (crossing the midline) and develops body and space relationships, agility, flexibility, and listening skills. On your mark, get set, get ready, GO! Have children run from one boundary to another with their scarf in hand or on their wrist. They will ask to do it again and again. Running, is a locomotor skill and a form of vigorous physical activity that increases the heart rate while improving fitness. Play “Follow the Leader.” Have children stand in a line, one person behind the other. When the music starts, the child at the head of the line does a movement with the scarf and all children will move their scarf in the same way as the leader (i.e., waving scarf overhead, swinging arms back and forth, jumping with the scarf, galloping with the scarf, etc.) When the music stops the child that was at the front of the line goes to the back and the next child in line becomes the leader. The music starts again and the game continues until everyone has had a chance to be the leader. Shake to my Lou my darling. I never tire of sharing games and activities using the very versatile Activity Hoop. In a blog I posted in May of 2010, I gave directions on how to play a non-competitive version of musical chairs using the hoop. This time, we’re going to use our imaginations as we pretend that our Activity Hoop is a steering wheel. Get ready to start your engines! 1. Children watch and listen as directions of how to play are demonstrated. 2. Each child, standing up, holds the hoop in front of their body. Tell them to imagine that the hoop is the steering wheel of a car and that they are the driver. 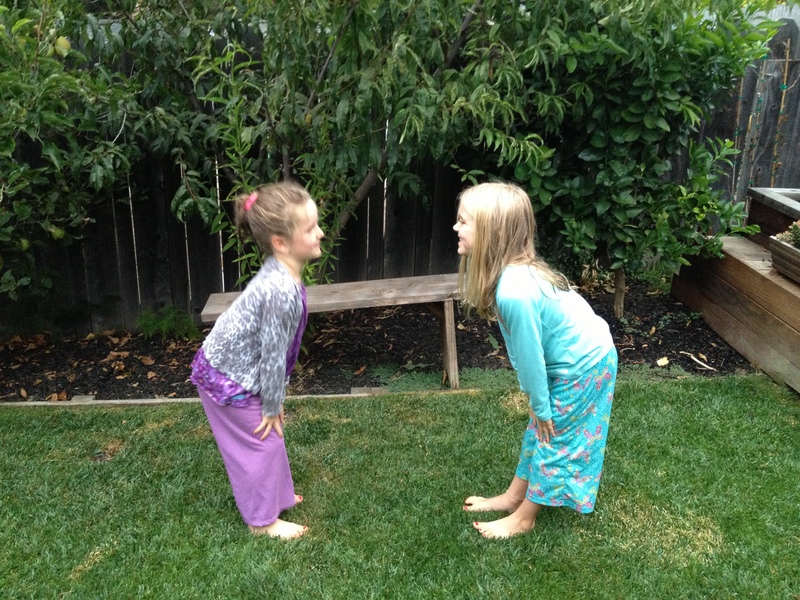 • With younger children only use 3 – 4 commands/movements. • Vary the length of time between the commands. • Try to “trick” children by repeating commands twice in a row. 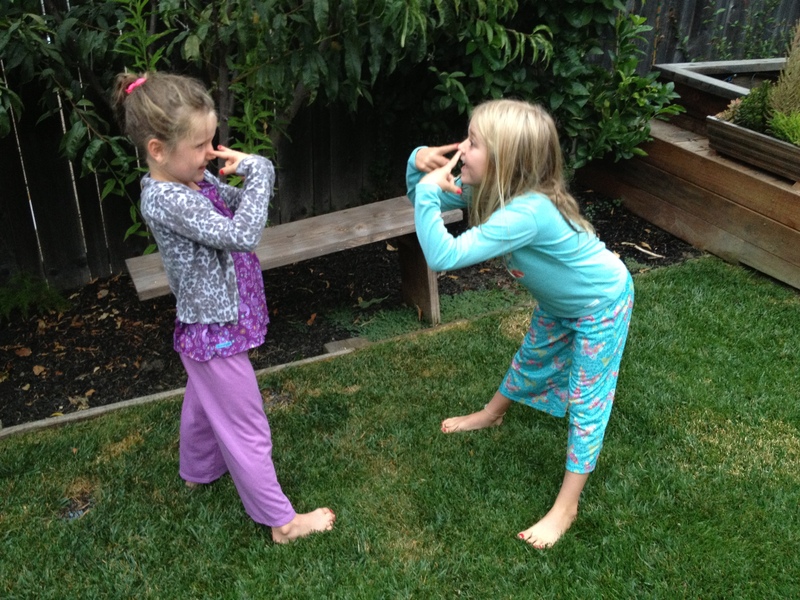 • Children may devise other commands and movements. 1. Instruct the children to put their hoop on the ground and stand inside it. 2. Tell them that the hoop is their steering wheel. 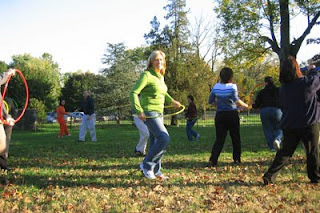 When the music starts, they are to lift the hoop up to waist level and use both hands to turn it right and left as if driving while they walk around in the open space. 3. When the music stops, the children stop and drop their hoops to the ground as if they’ve reached a stop sign or stop light. 4. When the music starts again, they bend down and pick up their hoops and continue to drive. 5. Fun ensues when you start and stop the music for short intervals or keep it on for long stretches. Add some dialogue to the game by mentioning that they may be caught speeding if going to fast. 6. The game lasts the length of one song. Challenge children with this variation of the game. When the music stops ask the children to pair up. One partner steps inside the hoop and holds it at waist level. The second player steps in front of his partner in the hoop and holds his hoop in front of his body like a steering wheel. 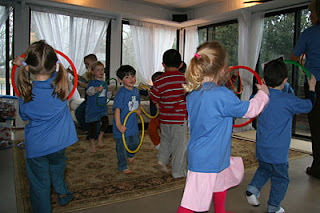 Children are to work together and move using both hoops when the music starts. When the music stops, they switch places and get to play opposite roles. This game teaches the children to work together and make cooperative decisions about moving in the same direction. Encourage the partners to come up with other ways to move together using both hoops. 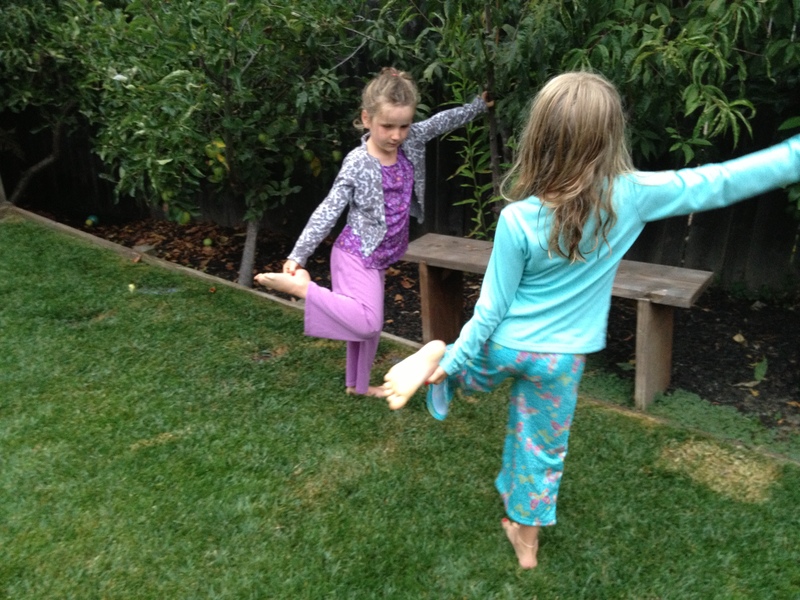 • Locomotor transport skills: body moves from one place to another by walking, leaping, hopping, skipping, etc.